Helping clients become self-sufficient in user experience is one of the prime motivations of our work. Our user experience consulting experience showed us many clients who made the same mistakes when trying to make user experience happen and so failed to reap the business benefits. We also noticed other clients who got it right and went from strength to strength. – Mike Jones, Nottinghamshire County Council. Clients who got it wrong tended to see user experience as screen design: choosing the correct fonts, colours and icons. In fact, user experience is a process: it is not something that can be stapled on at the end of development. To say that user experience is about screen design is as erroneous as saying that branding is all about a good logo. Of course screen design plays a role in user experience, but it is a small role. This means that optimising the colours, fonts and icons on your site will improve user experience by, at best, 15%. It’s like the old adage: you can put make-up on a pig, but it’s still a pig. Clients who got it right realised that screen design is just one of three important components. 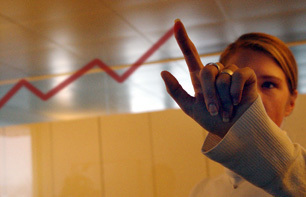 Web sites that score high on user experience also show a second key feature: consistency. Consistency accounts for about 25% of a web site's user experience. We can all point to annoying inconsistencies in (or between) much of the software we use. For example, the “Cut and Paste” operation in Microsoft Excel works differently from every other piece of software — even other Microsoft products. Choose “Cut” in Microsoft Word and the selection disappears. Choose “Cut” in Microsoft Excel and ‘marching ants’ appear around the selection, but it remains where it is. The third component of user experience, the remaining 60%, is accounted for by task focus. You know a web site has task focus when you get a warm feeling that the person who designed the site knew exactly what you wanted to do. The site works the way you expect. There is no need to go searching through menus or dialogue boxes for obscure commands: the main things you want to do are there, in front of you: easy to find and simple to carry out. The web site delights you. Another example comes from the world of successful computer games: very quickly, the “interface” disappears and you are exploring the world of the game — the task. Rules for good visual design are plentiful — you can get them from a book. Using code libraries and then testing against a Style Guide can achieve consistency. But achieving task focus is much more complicated — it requires a process, and it is the substance of the user experience process standard that we use. One of the strengths of the method is that it can be tailored to support existing design methodologies. Because the process is not tied to any one notation or tool set, it can be easily adapted to create models in whichever notation and tool set the programming team uses. By following our human-centred design process, project managers, designers and developers can ensure that systems will be effective, efficient and satisfying for customers. Track real-world usage and continuously improve the system. Based on the International Standard, ISO 13407:1999 "Human-centred design processes for interactive systems", our method has been applied to a range of clients in diverse industries. Active involvement of customers (or those who speak for them). Appropriate allocation of function (making sure human skill is used properly). Iteration of design solutions (therefore allow time in project planning). Multi-disciplinary design (but beware overly large design teams). Understand and specify the context of use (make it explicit — avoid assuming it is obvious). Specify user and socio-cultural requirements (note there will be a variety of different viewpoints and individuality). Produce design solutions (note plural, multiple designs encourage creativity). Evaluate designs against requirements (involves real customer testing not just convincing demonstrations). The standard itself is generic and can be applied to any system or product. We have applied it in organisations using formal PRINCE2 methodologies and in small, fast-moving software development companies. The approach is iterative and deliverable-based; forms or designs are completed at the end of each stage, which then constitutes the requirements and design specification for a project. Institutionalising Usability: 5 Ways to embed usability in your company. Selling usability to your manager. A Business Case for Usability. 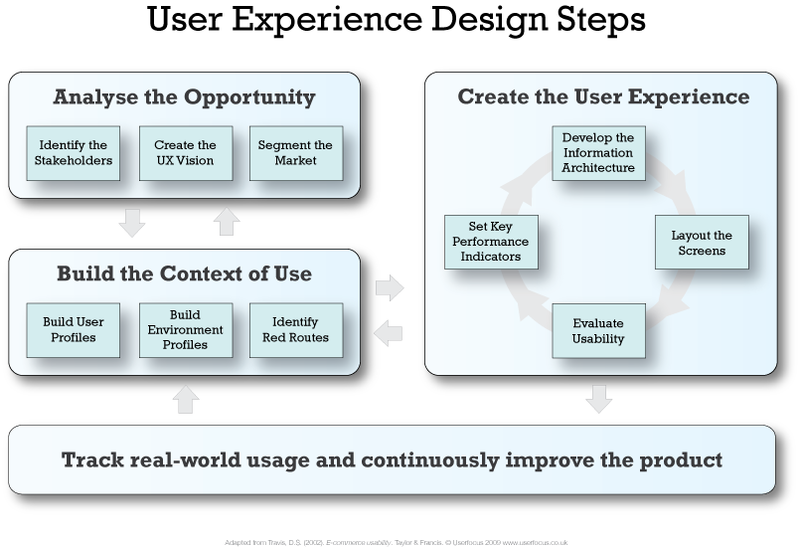 See all our articles & resources on user experience strategy. 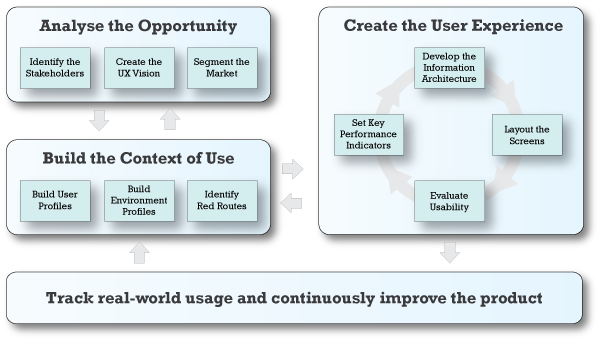 If you're interested in user experience strategy, try these services.